A long-running undercover police operation in the Bedfordshire town of Luton, which has contributed evidence to a recent counter-terrorism trial, helped build up an incredibly detailed picture of the depths of loathing for Britain felt by the men at the heart of the investigation. Kamal switches on the recorder and speaks into the microphone, stating the date, the time and where he's about to go. And then he leaves the house, leaves his true self behind, and walks towards danger. The undercover officer has followed this same routine for 20 months - although sometimes it was too risky to be wired up. With a fake name, fake wife, fake home and fake business in Luton, he was on a high-risk mission to record hundreds of encounters with supporters of a banned jihadist network that can be linked to dozens of counter-terrorism cases over more than a decade. Three men were convicted at the Old Bailey this week for inviting support for the self-styled Islamic State group. Inside Court 14 at the Old Bailey, Kamal testified from behind a curtain to protect his anonymity; while the jury could see him, we could not. Kamal attended talks in two key locations in Luton: in a specially-erected back garden marquee and a Methodist church hall. In both, he heard speakers scorn Western values and heap praise on jihadist attacks around the world. They were delivered to audiences of up to 80 people, often including children. During the summer of 2014, the marquee gained a banner noting the creation of a "caliphate" - or Islamic state - by the IS group in June that year. Kamal said the only people allowed in were men and they would sit in rough rows "anywhere they could grab a space". Some of the fathers would bring their sons. "Some of the children were very attentive," he said. "Some of the others would be chatting among themselves and you'd hear people telling them to shush." On 26 June 2015, IS followers carried out three attacks across the world. A gunman killed 38 holidaymakers at a beach resort in Tunisia, 30 of them British. In France, a man murdered and decapitated his boss at an American-owned factory. And in Kuwait, a suicide bomber took the lives of 27 prayer-goers at a Shia mosque, a branch of Islam branded heretical by IS. Back in the Luton marquee, "Mohammed" from west London spoke with enthusiasm about the day. "You hate the kuffar [non-Muslim] even if he does good for you," he told his audience. "You hate him with a passion. Don't feel sorry for any Britons in Tunisia. Don't feel sorry for any factory workers in France. Don't feel sorry for any temple worshippers in Kuwait." Mohammed was never charged in relation to that speech - but it was not the only one sowing division. Days later in a meeting held in the town's St Margaret's Church, another speaker, Mohammed Alamgir, said: "The sun has already set on the British Empire and the sun has started to rise for this Islamic State. "Freedom and democracy is dead… a handful of Muslims, the so-called extremists and the so-called terrorists, they've succeeded in destroying the ideology of the kuffar." Was there ever any dissent or disagreement with these speeches, asked Judge Michael Topolski QC. For almost 20 years, Luton has been a centre of operations of the long-banned al-Muhajiroun (ALM) network, first under its founder, Omar Bakri Mohammad, and then under his successor Anjem Choudary. 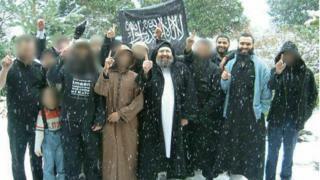 Choudary and Mohammed Mizanur Rahman, who have been convicted in a separate trial of inviting support for IS, were the most powerful ideologues inside the movement and they would regularly travel to speak at gatherings in the town. For years the group taunted the police and MI5 despite frequent prosecutions and disruption. As the threat of IS grew in the UK, counter-terrorism chiefs became determined to smash the Luton end of the ALM network. They had succeeded in placing Kamal inside the tent but needed to get closer to the main players. The trial heard that at a number of meetings from May 2015, MI5 allegedly sought to recruit Rajib Khan, a long-time member of ALM in Luton. Khan described discreet encounters in which officers from the Security Service pumped him for information and tried to tempt him with the offer of cash and what he called James Bond-style training. As is standard with all of its operations, MI5 neither confirms nor denies whether such encounters took place. Syria was never far from anyone's lips, thoughts or actions. A frequent topic of conversation within the group was former Luton resident Abu Rahin Aziz, who was blown up in a US drone strike against the IS stronghold of Raqqa in July 2015. Kamal said that Aziz was viewed as a hero by the men who spoke in the back garden tent. They believed he died as a martyr. Some were in tears when news emerged of his violent demise - and those in the audience were castigated for not being prepared to make the same sacrifice for their faith. The long-running police and MI5 operation into the ALM network fronted by the undercover officer Kamal means that five of its leaders and supporters now face prison sentences. Commander Dean Haydon from the Metropolitan Police said: "Speeches like theirs inspire the terrorists of tomorrow." What is not clear is whether inspiration will now spring from other sources.